Like many of you, I have family and friends on the east coast currently buckled down for the storm of the decade. While thanking our lucky stars we don’t share the same timezone, my wife and I felt an minor 4.0 trembler that reminded us that no place is without risks. The same tremors were felt in the consumer electronics market last week with the dual launch of both the iPad Mini and the Microsoft Surface. One of the key measures of launch success is how long the meme persists in the user mindshare, something we happen to measure at Argus Insights. Below is the rough mindshare volume of the iPad Mini as compared to other products/brands mentioned within our iPad stream. A falloff is to be expected, considering the buzz around the launch (see our earlier post here) but what’s interesting is the lack of any mentions of Microsoft Surface. Only the usual suspects from Samsung and Amazon can even penetrate the buzz around the Mini. When we examine a similar view of the Window 8 stream and look for evidence of Surface excitement we are faced with a different story. Of course the new version of Windows is dominate but the day of the Surface launch event we seek the peak in user mentions of Surface. Just two days later the Surface is almost wiped clean by co-mentions of the iPad Mini? What gives? Aren’t there stories of people lined up to buy the Surface Tablet with it’s cool Touch Cover and complete Office Suite? When we dig into the actual mentions we find the culprit, Microsoft themselves. So anxious to ensure Apple didn’t steal any thunder from their events last week, Win 8’s fearless leader specifically compared the Surface to the iPad Mini, calling the Mini only “recreational” while the Surface is the more modern mullet, business by day, party by night. The update of this particular story almost blotted discussion of the Surface from the Twitter-sphere and provided Apple a voice where they previously had little. Both products will find their sweet spot within the market. As soon as we have actual user data to share (not just expert reviews) we’ll let you know the results of the next face-off between these two high pressure systems and be able to forecast which product will produce the most rain for their maker. In a week where presidential candidates faced off on the policies that shape America’s interactions with the rest of the world, the whole world was focused on two different events, Apple’s subtle launch of the “condensed” iPad Mini and Microsoft’s much maligned release of Windows 8. Much the way pollsters pester us prolifically with prodding panderings of what they consider to be poignant questions (that alliteration is for you Ms. Norman, my junior English teacher), Argus Insights has been tracking how the market has responded to these two counterstrikes in the battle for the hearts, minds, and wallets of consumers the world over. 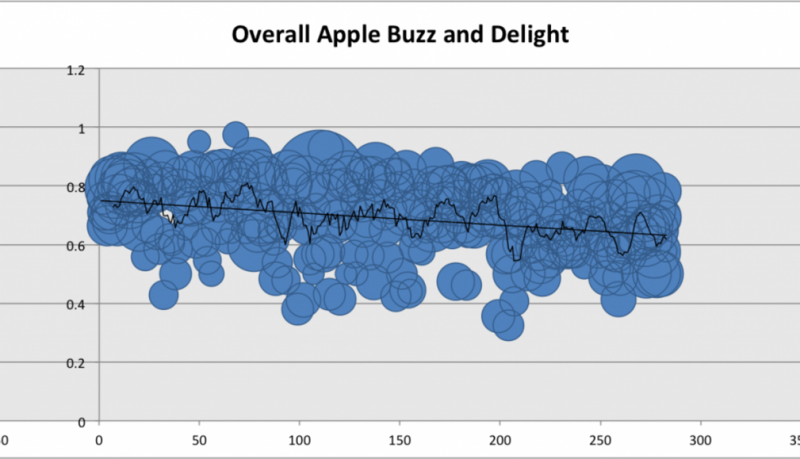 In the graphs below you’ll find the standardized buzz levels and sentiment scores for the two brands as they duke it out, reported hour by hour starting at midnight GMT on 22 Oct 2012. 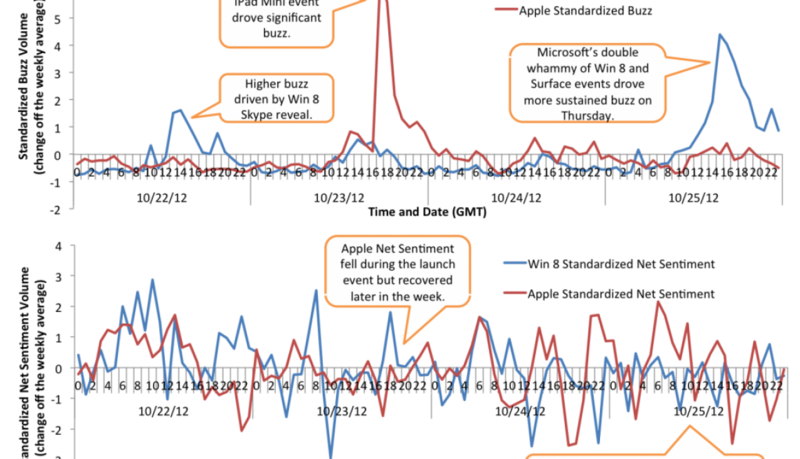 While Apple definitely receive higher overall levels of buzz than Windows 8, by standardizing the buzz and net sentiment we can see how much these launch events moved the needle for both brands. 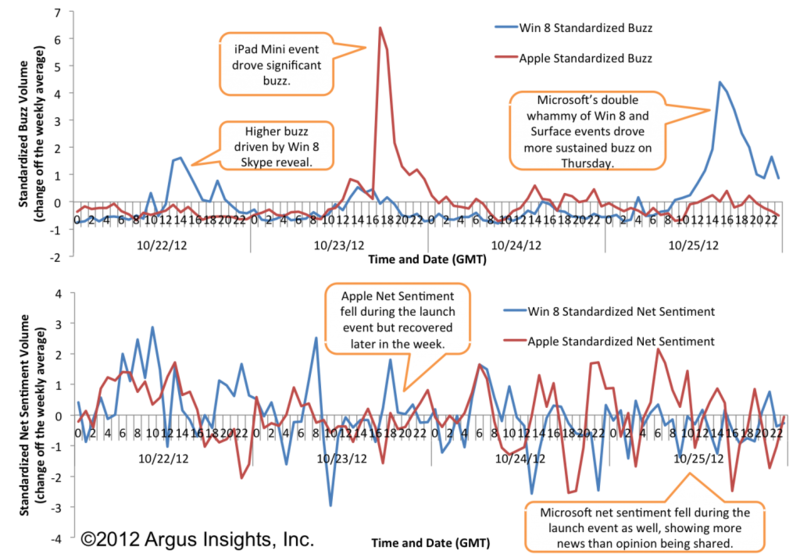 A strange phenomenon of launch events is that the net sentiment actually dropped during the event for both companies, not driven by negative vibes being tweeted by consumers but the flood of more neutrally worded news items. Consumers will start engaging more directly after the events when they can get their hands on these new devices and see if the magical condensation promised at the launches. Watch early next week when we share the results of Google’s salvo into the fray on 28 Oct 2012 and we see how consumers react to both the new Apple and Windows products. Is Apple starting to rot or just age gracefully? Growing up, my grandparents had a match pair of apple head dolls next to their fireplace. I always thought the wizened heads were amazing. When I tried to replicate the process of carving and then drying the apple the result was an ant infested rotten apple. 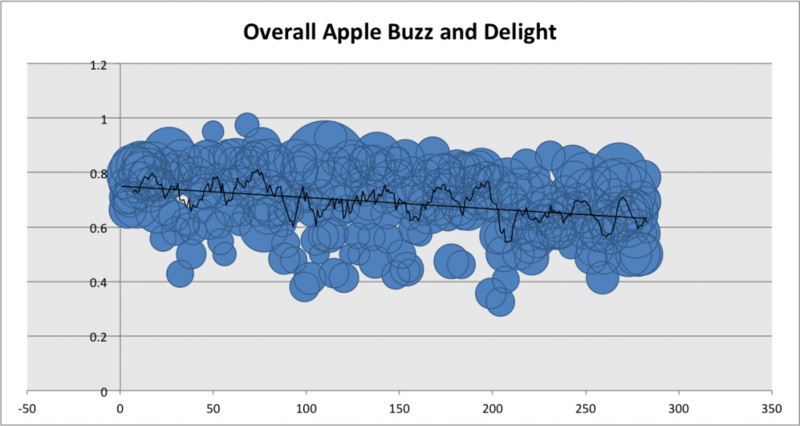 Which path is Apple headed down and can they recover? Our tracking of Social Capital shows that the consumer market is falling out of love with Apple. Companies rely on the release of new products to boost their Social Capital with consumers as all customers eventually fall out of love with their experiences (Harleys and a good single malt excluded). What’s troublesome as you can see in the graph below, is that Apple’s new products have not succeeded in providing that critical boost, especially prior to the crucial holiday season. But didn’t Apple just launch the iPhone 5? Shouldn’t that be driving the market mad with desire? 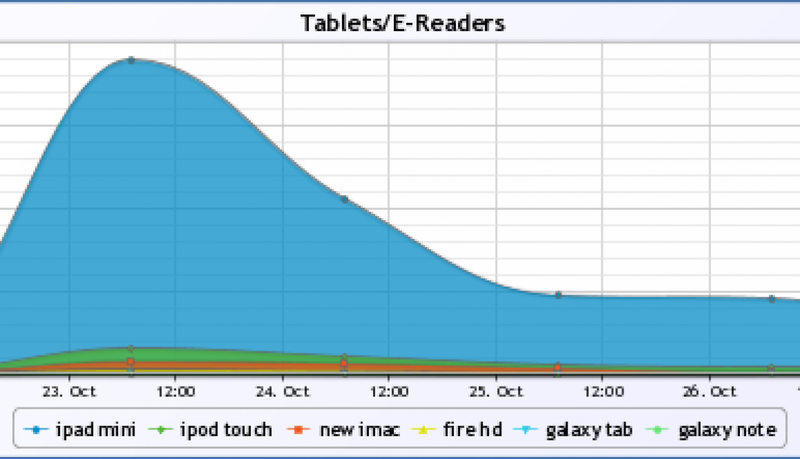 Actually, the biggest impact of the iPhone 5 launch was to drive buzz around the iPhone 4S as you can see from the two graphs below. Not only did the iPhone have a poor start (worst in years for an iPhone) but it dropped after the initial response. It has recovered but isn’t delighting consumers at the level expected. 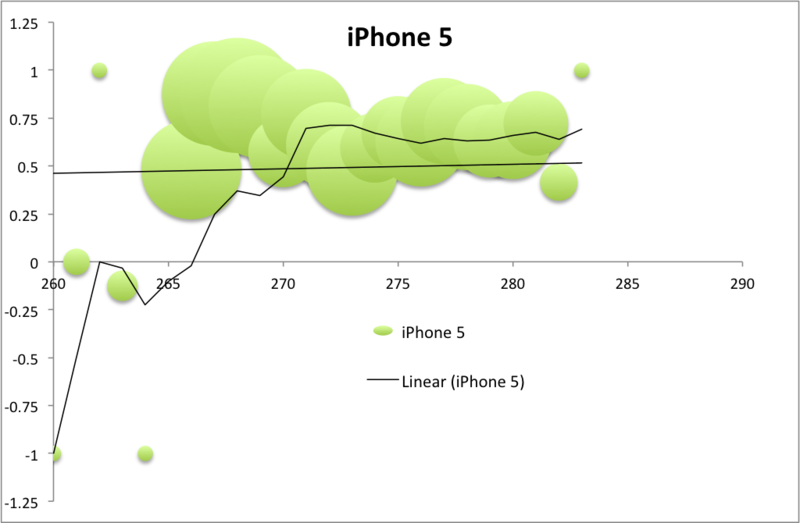 Buzz levels for the iPhone 4S are actually on par with the iPhone 5. 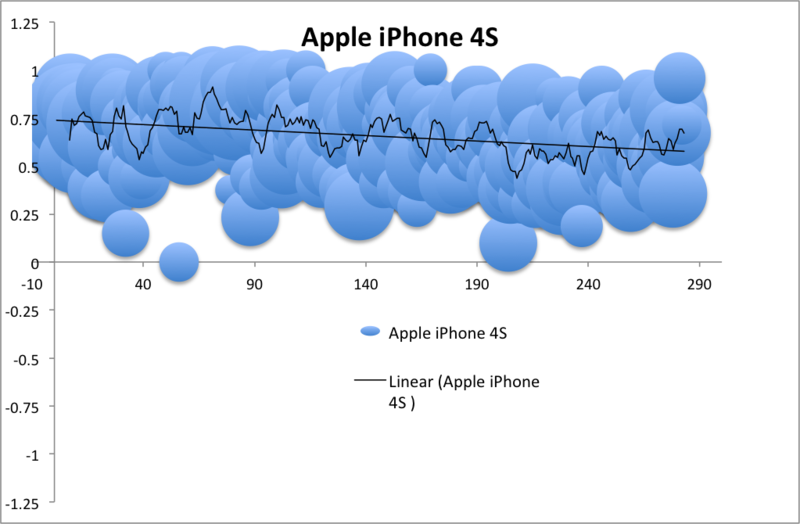 Historically the buzz (and corresponding demand levels) for older iPhones have dropped in the face of new launches. The iPhone 4S hasn’t. Neither did the iPad 2 after the new iPad was released earlier this year. In fact, buzz for the iPad 2 increased and outpaced the new iPad. 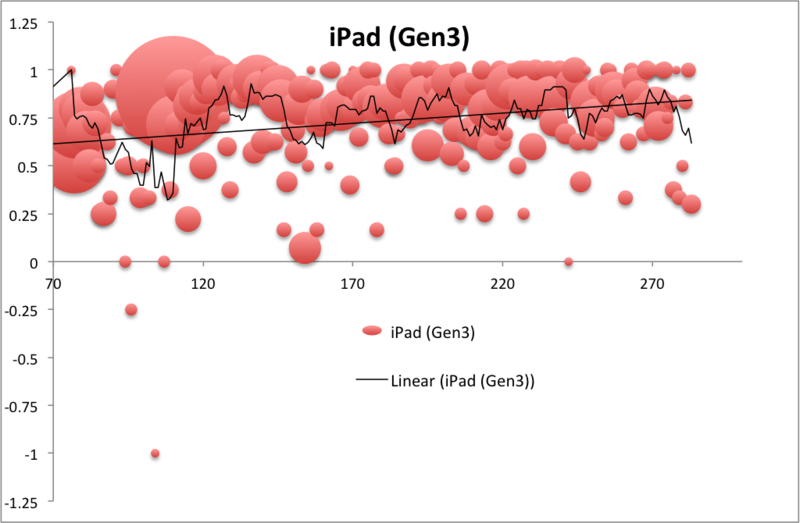 Only now is the iPad 3 reaching it’s full potential, after the iPad 2 inventory has been depleted. For both the iPhone 5 and the new iPad, when a lower priced Apple alternative existed on the market, consumers continued to flock to the older product, showing the price sensitivity of the broad market as compared to the typical price insensitivity of Apple’s core fans. In the case of the iPad 3 and now the iPhone 5, reviews went down after launch, something that hasn’t happened to an Apple product in YEARS! This is the same pattern of decline we saw with RIM and Motorola in smartphones. Will an iPad mini refresh Apple’s Social Capital? Doubtful based on the current landscape but its still too soon to tell whether Apple will age gracefully, shrinking slowly like an apple doll, or rot quickly and be consumed by an angry market of ants.